Laura Reichhardt at the 2006 Día del Campesino health fair in San Luis, Arizona. 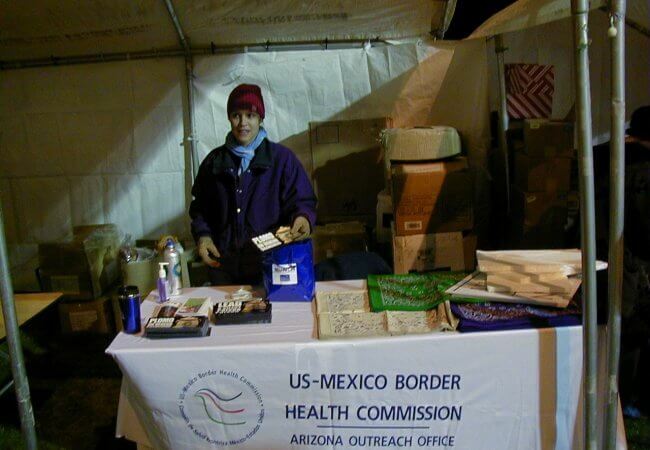 Reichhardt started her career in community health, focused on U.S.-Mexico border health. Here, she hands out lead screening tools and bandanas, which are used by migrant farmworkers for protection from sun and the elements. Nursing Journeys is a profile series featuring Action Coalition leaders discussing their career paths and reflecting on the lessons they’ve learned. Laura Reichhardt, MS, APRN, NP-C, is the director of the Hawaii State Center for Nursing and an adult-geriatric nurse practitioner. Her answers to the questions below show her path from being a public health and health care administration professional to her work today advocating for nurses through national, state, and local initiatives and partnerships with schools of nursing, nursing employers, interprofessional health care partners, and policymakers across the state. I started my career in public health, focusing on U.S.-Mexico border health, and then moved to health care administration and quality metrics for a large health care insurance company. After developing large population health interventions, I realized I would find it more fulfilling to become a clinician. I felt nursing was closest to my personal values and the values I acquired as a public health professional. I applied to a master’s entry program in nursing with an emphasis in an adult-gerontology nurse practitioner curriculum. Describe the journey you took to get from that decision to where you are today. 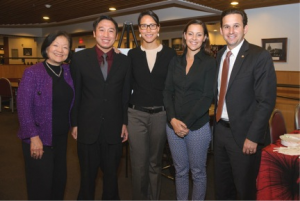 Hawaii Senator Mazie Hirono, fellow University of Hawaii School of Nursing students Gregory Gee and Elizabeth Alonzo, Laura Reichhardt, and Hawaii Senator Brian Schatz in Washington DC in 2014 after the AACN Student Policy Summit Institute. When I applied to nursing school, we were in the largest economic recession in decades. In my community, the hospital-based jobs available to new graduate nurses were sparse. 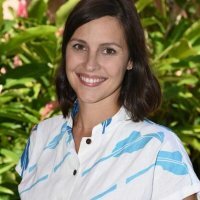 Through a nursing policy fellowship, I had a unique opportunity to work with the dean of University of Hawai‘i at Manoa School of Nursing, and the Hawai‘i State Center for Nursing. And they secured a policy internship for state Sen. Rosalyn Baker, who at the time was the chair of the Senate Committee on Commerce, Consumer Protection and the vice chair of the Senate Committee on Health. These opportunities, coupled with my public health background and my new nursing knowledge, positioned me to have a new population focus for my work: nurses! It is rewarding working for nurses and ensuring they are considered in policy and workforce planning efforts. What impact did the Institute of Medicine’s Future of Nursing report have on you? This report, published the year before I began nursing school, was a guiding principle to the work we were endeavoring to do. Today, I consider it a foundational piece of my work. It is a tool I use as validation for our local work and the priorities our stakeholders identify. It remains relevant and it serves as a benchmark for the progress we have made in our state and in the nation. How have you been involved with the Campaign for Action? Reichhardt in 2017, two years into her tenure as director of the Hawai‘i State Center for Nursing. As director of the Hawai‘i State Center for Nursing, I have the pleasure of being a co-lead and the administrative organizer for Hawai‘i Action Coalition activities. Our state received an Academic Progression in Nursing grant from the Robert Wood Johnson Foundation, which provided us resources to increase our BSN percentage considerably. We also engage in efforts to remove barriers to advanced practice registered nurse (APRN) practice, secure nursing student intern positions in our state legislature, support and engage in interprofessional education efforts, expand access to health care with school-based health initiatives, and have a robust nursing workforce research and statewide nurse residency collaborative within the Center. The work done at the Center for Nursing represents the Campaign’s goals, and also has broadened to include Culture of Health initiatives. In 2017, a meeting that I organized of health profession deans led to legislative support to increase the number of health care preceptors—work that has also opened our eyes to the needs of preceptors and their critical role in health care education. At the meeting, we were able to demonstrate through data a true crisis in access to preceptors and the impact it had on the ability to admit students into health care programs. The following legislative session, this group asked the state legislature for help. What resulted was an interprofessional health care professional preceptor tax credit. Starting in 2019, APRNs, physicians, and pharmacists licensed in Hawai‘i who precept in-state APRN, medical, or pharmacy students can receive up to $5,000 in state income tax credit. What is the most important action that nurses can take to lead the way to improve health and health care in America? Commit to action and follow the nursing process, which is assessment, diagnosis, outcomes/planning, implementation, and evaluation. Nurses are the largest population of health care professionals. From leading unit-based quality improvement initiatives to neighborhood voting registration campaigns, to systems improvement efforts, we are well prepared for leading change. Further, our preparation to follow the nursing process can be applied everywhere: from patient management to policy. I’m a millennial, so I think my generation is still often considered “the next generation.” My generation, and the one that is only now in nursing school, is quick to identify systemic calcifications… workflows and processes that perhaps once worked but today are stiff and need some intervention. My advice is to identify practical, feasible solutions where improvements are warranted. I also would advise that we take to heart the #KonMari method and apply it to nursing. We need to simplify our process and used evidence-based practice to create the opportunities for advancements in care. My greatest hope is that we apply our “millennial brains” that are primed for multitasking, technology, and collaborative work to achieve health equity, improved health care quality, and innovation so that one day our society’s needs are no longer outpacing our capacity to provide needed care.